Working should be a route out of poverty, but for some, low wages are a poverty trap. The current minimum wage is inadequate as at $11/ hour, it places workers as far as $8,000 below the poverty line. Minimum wage should be increased through pre-announced steps to $15.53/ hour and then indexed at that point. The current plan by the Manitoba government would tie minimum wage increases to the rate of inflation or less, freezing or lowering the buying power of the most vulnerable workers in Manitoba. Under Bill 33, future minimum wage increases would be set at the rate of the consumer price index (CPI), or in the case of negative economic conditions such as a recession, no increase will be made. This legislation would give workers only a $0.15 increase in minimum wage in 2017. One way to see the impact this legislation could have on workers is to look back to see how this legislation compares to recent increases in minimum wage. 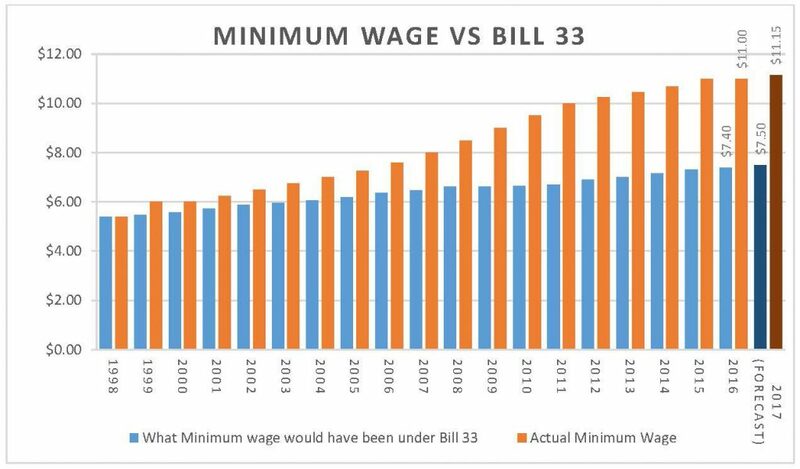 If Bill 33 had been in place between 1998 and 2016, minimum wage today would be only $7.40, $3.60 lower than it is currently. There is much more catching up to do to raise minimum wage above the poverty line. According to Statistics Canada, 38,600 Manitobans work for minimum wage, 55% are over age 20. More than half work for companies with more than 100 employees and 41% in firms with over 500 employees. The majority of minimum wage workers are women. Many have children to care for. Minimum wage also has an impact on all low wage workers. 73,700 Manitobans earn 10 percent above the minimum wage or less. In all this represents 18.5% of Manitoba workers. Who are these workers? People we all rely on every day such as retail store workers, building cleaners, and food service workers. Yet these members of our community struggle to make ends meet, which impacts health and well-being. Researchers have become increasingly aware of the damaging effects that both poverty and low-income can have on the mental and physical health of individuals and families. Income is a social determinant of health as it provides for shelter, food, recreation and the ability to participate in society. Research shows that living in poverty can cause stress and anxiety, which damages health. Low income limits peoples’ choices. People cannot escape poverty while struggling to survive on poverty wages. The Winnipeg Chamber calls for a strategy to get minimum wage earners into jobs that improve pay: yes that should be a priority. But to deny an increase to minimum wage that allows people to live in dignity sentences minimum wage workers to continue to struggle with poverty. A good proportion of those earning minimum wage are not upwardly mobile: 36% have done so for one to five years and 17% for over five years and no wage earner should have to subsist on subpar wages. The most effective and efficient way to improve substandard wages is to increase minimum wage to a non-poverty wage. Neither the business community nor Manitobans in general should fear an increase in minimum wage. If we look over time and across Canada, increasing the minimum wage does not result in job losses. A Canadian Centre for Policy Alternatives study of all provincial minimum wages and employment changes from 1983 – 2012 found no consistent evidence that minimum wage affects employment levels. Employment, job loss and job creation are determined by larger economic factors, not minimum wage policy. When considering where to locate in Canada businesses take into account many factors, including the cost of inputs (goods, utilities, insurance and labour etc). Studies show that minimum wage is not a significant factor. In fact, low wage employers dominate service sectors and must stay close to the consumers that support their businesses. From an employer perspective, a higher minimum wage results in lower turn¬over rates, reducing costly searches to fill positions, training costs and employee turn-over. Economic development relies on consumer spending. Higher wages feed back into stronger demand and more jobs. Minimum wage earners spend in the local economy on basic goods and services, which benefits Winnipeg and Manitoba businesses. Higher wages also improve health and educational outcomes for minimum wage workers and their children and families. This saves the province money on health and education spending. The current minimum wage provides a full time worker with a market income of just $21,450. The Low Income Cut Off – Before Tax level for 2014 (the most recent year available) was set at $30,286 for a family of two. A single parent with one child, working full time, would need a wage of at least $15.53 per hour to get above the poverty line. If this legislation is passed, families will continue to have to choose between paying rent or buying food, while stretching a paycheck that does not last till the end of the month. It will extinguish hopes of homeownership or of putting money aside for education or retirement for tens of thousands of Manitoba workers. The government should instead develop a long-term minimum wage strategy, including planned incremental increases, to raise minimum wage above the poverty level so that all workers can enjoy the benefits of a prosperous Manitoba economy. Josh Brandon is Chair of Make Poverty History Manitoba and Molly McCracken is the director of the Canadian Centre for Policy Alternatives Manitoba office.